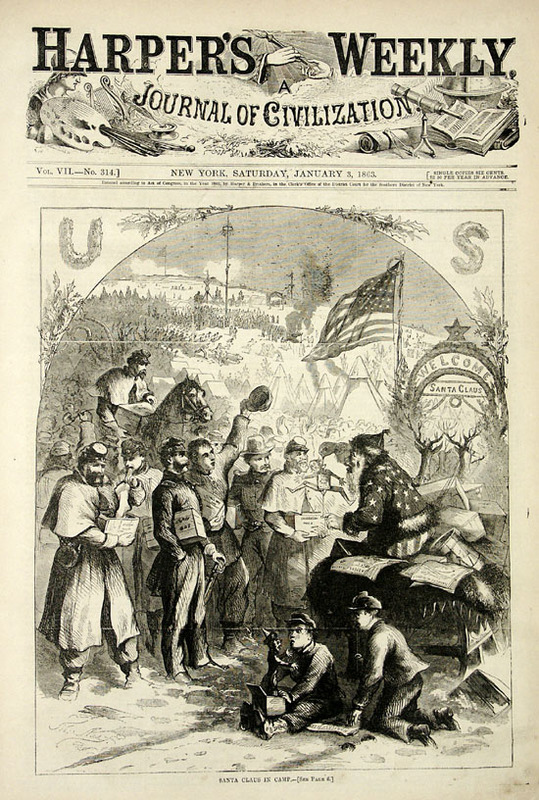 Below: Thomas Nast’s first published drawing featuring Santa Claus; for Harper’s Weekly, “A Journal of Civilization,” January 3, 1863 Nast portrayed the elf distributing packages to Union troops: “Santa Claus in camp.” Nast (1840-1904) was 23 when he drew this image. This entry was posted on Monday, December 24th, 2007 at 6:08 am and is filed under Art, Business, Cartoons, Family, History, History and art, History images, Holidays, Newspapers, Poetry, Political cartoons. You can follow any responses to this entry through the RSS 2.0 feed. You can leave a response, or trackback from your own site. If I could ever get any electives approved (no luck so far) it would tons of fun to do a semester just on Nast’s influence on America.